Satvinder Soomal and Specsavers go way back. Specsavers’ head of enhanced optical services for the Midlands joined the Walsall store as a 15-year-old on work experience. An optical assistant at 16, he went on to be a contact lens optician. 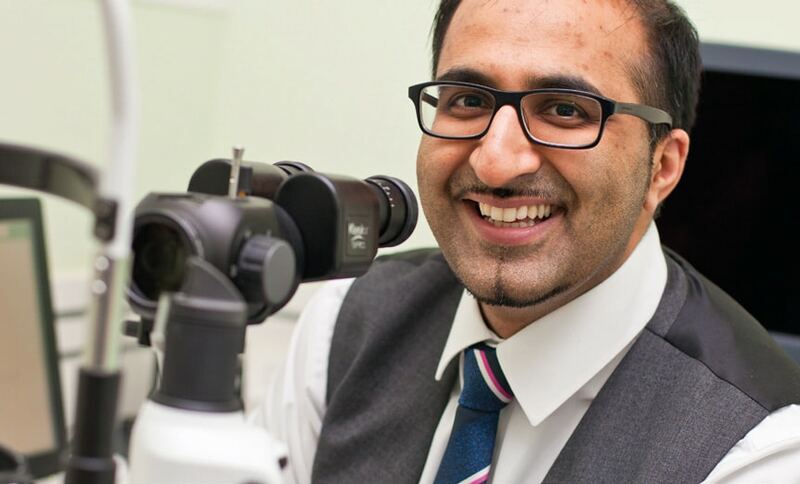 Then training as an optometrist, Sat went on to spend 10 years in hospital optometry at the Birmingham & Midland Eye Centre, eventually becoming their deputy head of optometry. There he said dreamed of starting an independent practice with ophthalmologist colleagues. But discussions with Specsavers’ cofounder Doug Perkins and clinical services director Giles Edmonds changed his future. He says: ‘I shared my thoughts about delivering the advanced HES [hospital eye service] level of optometric care in primary care. ‘Giles explained this was exactly what Specsavers was doing: bridging the gap between optometry and phthalmology; upskilling optometrists to provide more advanced skills such as MECS, glaucoma and cataract care and training the entire workforce to deliver a higher level of patient care through EOS. So, in 2016, Sat re-joined Specsavers as a partner at Daventry. He’s now also a partner at Towcester and has joined the Professional Advancement team. ‘The opportunities are amazing,’ he says. ‘I’m a lead WOPEC assessor; I deliver advanced skills workshops; I’m involved with pre-registration and newly-qualified optometrists; I represent optometrists at local partnership forums; I work with Newmedica ophthalmologists; and I get to work with brilliant people – real leaders in optometry advancement in the UK. ‘There aren’t enough hours in the day, but it doesn’t seem like work. I want to do more!